Long story short, I learned that (1) without the aid of industrial waxing solutions, no floor is going to maintain that wet luster. Even after four hours of scrubbing. And (2) my mother was a sneaky little stinker. Cake decorating is much the same. There are lovely pictures of perfectly smooth gateaux mocking you from their grocery checkout perches, tempting examples of confectionary perfection that goad you into trying your hand at it. But you need some helpful hints, the right equipment and practice before achieving magazine cover caliber results. Oh yeah, and like linoleum, you’re going to need the pastry equivalent of industrial wax. 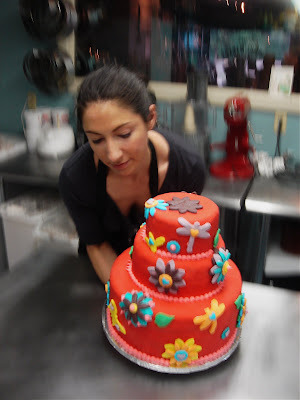 You need fondant because even with a steady hand, years of experience and saintly patience, you’ll never produce that perfectly smooth sugar bomb without it. And very much like wax, it tastes like crap. But no matter, this is an exercise in beauty, right? 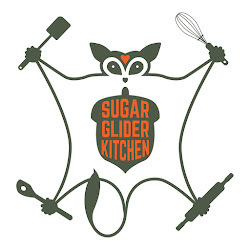 Who cares if your cake is the taste equivalent of sweetened Mr. Clean? It’s like expecting your botoxed and siliconed neighbor to recite the Canterbury Tales in Olde English. Ain’t going to happen. It’s there to be pretty, don’t ask any more of it. So let’s get started in the high art of pastry superficiality. First, go buy some fondant. You heard me, go buy it. Go to your local crafty store, like a Michaels, and hang a left into their cake-decorating aisle and grab yourself a box of rolling fondant. They come in an array of gloriously toxic colors, so have fun. Because you don’t make fondant. I mean, you could, but you just don’t. It’s like making your own Saran Wrap, technically you could. You just don’t. So you’ve bought your fondant. Now you want to use it. So you make a cake. But you don’t fill it with anything like a mousse or a tasty whipped cream. And you don’t fill the layers with glorious mounds of buttercream either. You can use buttercream, just not the mounds. You want a miniscule layer. Just enough to hold the thing together. And you want it all to be very symmetrical. You may even consider using a level to make sure you’re cake isn’t lopsided. Mine usually are. Why, you ask, all these restrictions? Well, because fondant can’t be refrigerated. So you don’t want anything that’s too wholesome and capable of sustaining lifeforms that can cause intestinal distress outside the fridge. And you don’t want so much filling that the cake is unstable. So you’re limited. Again, we’re talking looks here. Not substance. Before you get to covering your cake in a coating of sugar shellack, you’ve got to skim coat it with a bit of buttercream. Just enough to make it perfectly smooth all around and enough to provide a sticky based upon which your fondant can adhere itself, like a diabetic parasite. So you’ve got a smooth and even cake. You’re ready. So sprinkle a little cornstarch on your rolling surface. And roll out the fondant to a little over a 1/8 of an inch thick. Make sure your hands are clean and dry, your surface is the same and so is your rolling pin. Make sure you roll enough that you’ve got a nice little over hang with you cover the cake. But not so much that it’s so heavy it’ll start tearing. This takes practice. And you’re going to cry. I’m not going to lie. Beauty = pain. You already knew that. So you cover your cake and you tuck the little bit of extra fondant under the cake, essentially adhering it to your cake board. And as you drape it, you’ve been smoothing it with your hands so there aren’t any folds or kinks. Again, a little weeping is to be expected when you first start. 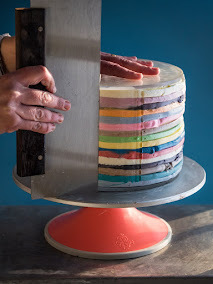 And once you can cover your cake without a call to your therapist, you can start experimenting with double layers of fondant and cut-outs. 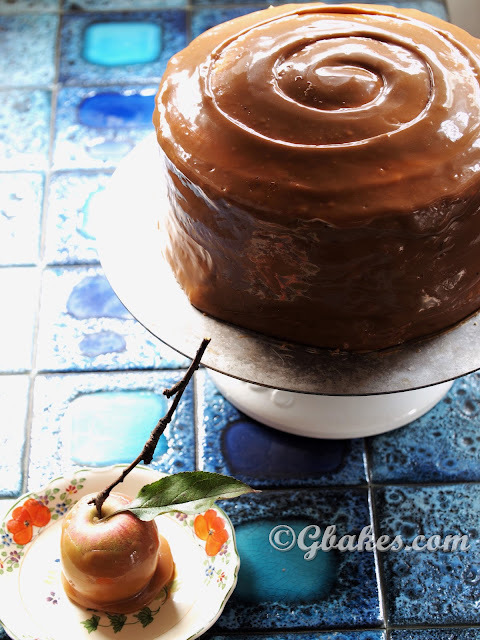 You’ll Tivo “Ace of Cakes.” You’ll buy fondant online wholesale, in buckets. pain. Roll out a bit and use cookie cutters to cut beautiful shapes. Animals, hearts, the State of Vermont (I have that cookie cutter, don’t mock). And you can stick these little sugary decals onto your traditionally frosted, and unbelievably scrumptious cream filled cake without sacrificing a bit of taste.